February was Black History Month and March is Bisexual Health Awareness Month, as well as Women’s History Month. As an out-and-proud Black bi femme, I reclaim February and March as Black Bi Women’s History and Health months. I use these two months to celebrate my existence and that of those like me, whose identities don’t fit neatly into the prescribed commemorative months and are often overlooked the rest of the year. The realities of our lives are often overlooked because of myths about what being bi or a woman or Black actually look like – one being that Black bi women like me don’t need access to abortion. Not all people who have abortions identify as heterosexual women. Bisexual women, our transgender siblings, nonbinary folks, our agender family, and so many other people also have abortions. In conversations about reproductive rights, the needs of LGBTQ+ people are often erased despite the fact that we face even greater barriers to getting the reproductive health care we need. I need access to the same exact reproductive healthcare that cisgender heterosexual women need. I need access to birth control, testing for sexually-transmitted infections, abortion, and culturally competent providers who understand my sexuality and my life, ones that will ensure that I get to lead the conversation during a doctor’s visit and encourage me to ask for what I need instead of making uninformed assumptions. Seeing a healthcare provider is too often something LGBTQ+ people avoid, and for understandable reasons. Sexual and reproductive healthcare have long been fields in which either our identities are ignored and we are assumed to be non-queer, or stereotypes and assumptions about our community kick in and our needs are left unaddressed. In either scenario, we are receiving substandard care. The barriers don’t end there. LGBTQ+ people are also more likely than non-LGBTQ+ people to be poor. This leads to having fewer resources to overcome the legal restrictions that can push a procedure like abortion out of reach, such as bans on insurance coverage that disproportionately harder for people with low incomes. Over the years, the ban has been extended to coverage for federal employees and their dependents, people who get their insurance through other government programs, including Native Americans, and immigrants in federal detention centers. It forces people to pay for abortion care out-of-pocket, which can be an impossible obstacle for LGBTQ+ people experiencing poverty. This interferes with one of the most important decisions anyone can make and even forces one in four poor women to carry an unwanted pregnancy to term. For far too long, cishet, white, middle-to-upper class women have been centered in the abortion and reproductive rights, and the ones whose ability to get care is the least in question. We must end that. It’s time to make access a reality for all of us. This week, a bicameral badass band of women of color in Congress introduced the EACH Woman Act, which brings us one step closer to affordable abortion care for all by ensuring insurance coverage for every woman, transgender, and gender non-conforming person. This introduction is revolutionary, not only because women of color are leading the effort, including Rep. Barbara Lee and Sen. Tammy Duckworth, Sen. Mazie Hirono, and Sen. Kamala Harris, but because this legislation centers the people most marginalized by society – poor people, people of color, and LGBTQ+ people. 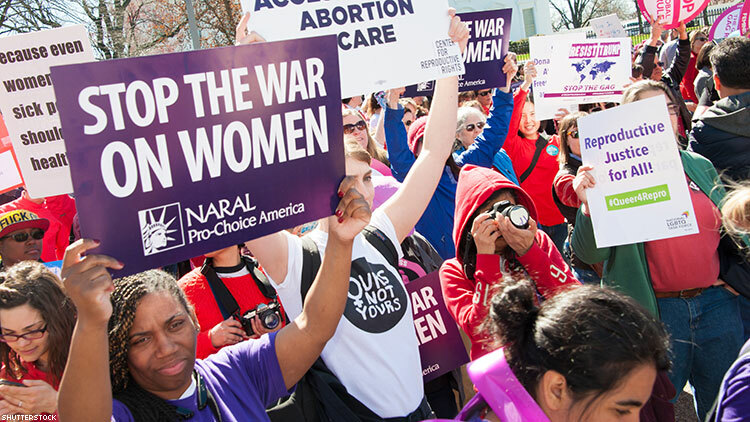 This bill aims to get rid of the horrific Hyde Amendment once and for all. We know that introducing a single piece of legislation will not liberate us, but working towards the passage of the EACH Woman Act changes the conversation around abortion. The law is so often decades or centuries behind culture and it very seldom is able to represent all of our intersections. The fight to make abortion accessible to all is a queer fight and the more we center queer voices and experiences, the more we will be free. Candace Bond-Theriault is the Senior Policy Counsel for Reproductive Rights, Health and Justice, and the Democracy Project Director at the National LGBTQ Task Force.